Search.SafeFinder.com is the PUP that uses misleading techniques to prevent removal. Use Reimage to locate malicious components and get rid of them faster than with uninstall instructions. A full system scan blocks virus reappearance and prevents traffic to malicious domains. How can I stop such programs before they enter my PC? Should I use Search.SafeFinder.com removal tool? Search.SafeFinder.com virus is just another name to identify Safe Finder virus, which is a potentially unwanted program (PUP). Technically, we cannot classify it as a virus, although its functionality barely differs from one. This questionable program can be installed on both Windows and Mac OS platforms, and hijack settings of three major web browsers – Internet Explorer, Google Chrome and Mozilla Firefox. This tool falsely claims to be designed to protect the user and his/hers computer during one’s browsing sessions, however, it seems that at this point we are dealing with a typical browser hijacker who tries to sugarcoat its real aims by introducing itself as a beneficial tool that can improve user’s browsing experience. If Search.SafeFinder.com virus started redirecting you to suspicious websites, discontinue using this questionable search engine and remove Safe Finder from the system! In this picture, you can see a screenshot of Search.SafeFinder.com virus. Once installed, this browser hijacker messes up your browser’s settings and makes you experience redirects to Search.SafeFinder.com search engine, because it sets this URL as a new default home and new tab page. In addition, you should keep in mind that you have to be very careful with its search results because they are likely to be altered. Also, try to avoid pop-up ads that may also be displayed by Search.SafeFinder.com because they can be filled with various links trying to redirect you to predetermined/affiliate websites. In most of the cases, this search site seeks to promote affiliate websites that pay for its owners in exchange for this doubtful marketing campaign. If your Internet Explorer, Google Chrome or Mozilla Firefox browsers have fallen victims to Search.SafeFinder.com hijack, you should use a step-by-step guide that is given below and remove this questionable search engine from the system. Otherwise, you may find yourself experiencing repetitious redirects to suspicious websites. By the way, this search engine is capable of tracking PC users because it collects details such as what sites people like to visit, how much time they spent on them, what search queries they made, etc. Please, be very careful and never allow such activities. 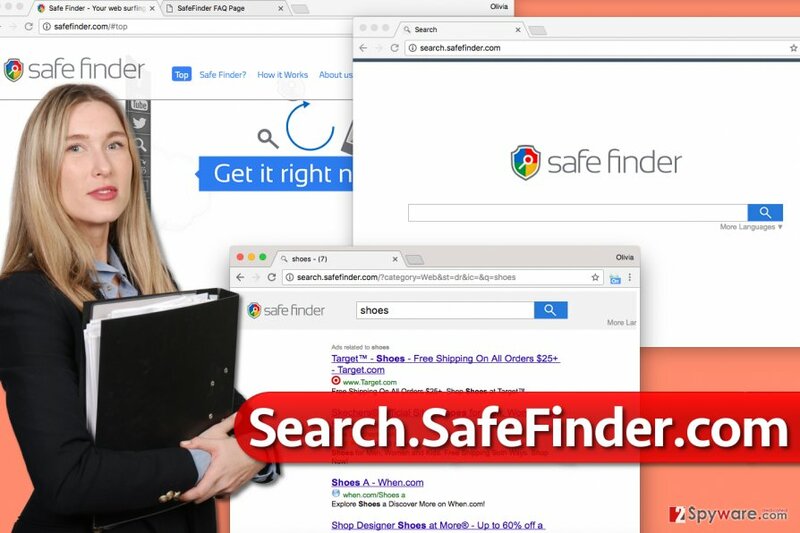 The easiest way to put an end to suspicious Safe Finder’s activity is to remove Search.SafeFinder.com software from your computer, and you can choose how you want to do it. If you’re looking for a manual Search.SafeFinder.com removal tutorial, you can find it at the end of this post. If you’re looking for automatic problem-solving software to remove this hijacker, we recommend using Reimage or Plumbytes Anti-MalwareMalwarebytes Malwarebytes. Search.SafeFinder.com can easily hijack your PC system unnoticed and show up on each of web browsers because it is distributed by a long list of freeware and shareware. We can hardly say what programs now contribute to promotion of this search tool, so you will have to use these general tips for trying to prevent infiltration of Search.SafeFinder.com virus. First of all, try to make a small research before installing freeware from unknown sources. Read reviews, comments and online discussions to check the program before installing it on the system. Secondly, read End User License Agreement to know more about the program that you want to install. Then, choose Custom or Advanced installation option and then follow every installation step of the freeware in order to find the check mark that allows installation of Search.SafeFinder.com or other “optional downloads”. Of course, you should uncheck it. If you found Search.SafeFinder.com instead of your start page or default search engine, you can remove it with a help of the guide we provided down below. It is up to you to decide which Search.SafeFinder.com removal method you prefer, however, we strongly recommend going for the automatic one because it is the easiest and most secure way to remove Search.SafeFinder.com virus. This search site may start causing lots of annoying ads, slow downs and similar inconveniences, and this can happen because the described hijacker tends to be distributed in conjunction with other PUPs. Finding all of them on your own is going to be a time-consuming task, so if you’re short of time, you can scan the system with tools such as Reimage. Uninstall all programs installed without your permission, for instance, Safe Finder (by Linkury) and LPT System Updater Service (by LPT). It is important that you remove ALL suspicious programs from there. Then, fix affected browser shortcuts as shown in the example below. This step is extremely important, so if you miss it, you might have to experience a search.safefinder.com comeback. Here, look for Search.SafeFinder.com or any other recently installed suspicious programs. Go to Applications folder and detect suspicious applications that you cannot remember installing. Move them all to Trash. You might find a program called Safe Finder, but remember that it can hide under a different name as well. Wait until you see Applications folder and look for Search.SafeFinder.com or any other suspicious programs on it. Now right click on every of such entries and select Move to Trash. When in the new window, check Delete personal settings and select Reset again to complete Search.SafeFinder.com removal. Once these steps are finished, Search.SafeFinder.com should be removed from your Microsoft Edge browser. Fix Firefox by deleting all additional extensions that were injected into your browser without your knowledge. You might want to refresh Firefox afterwards. Here, select Search.SafeFinder.com and other questionable plugins. Click Remove to delete these entries. Now you will see Reset Firefox to its default state message with Reset Firefox button. Click this button for several times and complete Search.SafeFinder.com removal. Open Chrome and eliminate extensions that weren’t added by your hand. You should be looking for extensions such as Safe Finder or LPT. Here, select Search.SafeFinder.com and other malicious plugins and select trash icon to delete these entries. Click Reset to confirm this action and complete Search.SafeFinder.com removal. Here, select Extensions and look for Search.SafeFinder.com or other suspicious entries. Click on the Uninstall button to get rid each of them. Here, look at the Homepage field. If it was altered by Search.SafeFinder.com, remove unwanted link and enter the one that you want to use for your searches. Remember to include the "http://" before typing in the address of the page. Now you will see a detailed dialog window filled with reset options. All of those options are usually checked, but you can specify which of them you want to reset. Click the Reset button to complete Search.SafeFinder.com removal process. ^ Gabriel E. Hall. What are browser hijackers and how to remove them. 2-Spyware. Fighting against Spyware. ^ The hijacker in your browser. BullGuard. PC Security - Antivirus, Spyware, Anti-Malware Articles. This entry was posted on 2017-04-06 at 03:14 and is filed under Stealing programs, Viruses. You can quickly scan the QR code with your mobile device and have Search.SafeFinder.com manual removal instructions right in your pocket. How did you remove Search.SafeFinder.com?